West End Park on attack against old Batelians in the recent Yorkshire Amateur League Division Five clash. 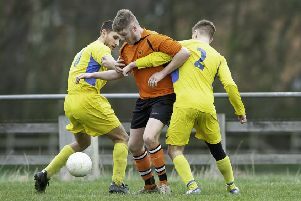 Savile United recorded a fifth straight win and remain top of Yorkshire Amateur League Division Five. They were too strong for Shire Academics Fourth team last Saturday and ran out 9-0 winners. Isan Safeer led the way with a hat-trick, there was a brace apiece for Adnan Khan and Mohammed Kadia with Mohammed Sacha and Omar Shaffique also on target. Batelians also boast a 100 per cent record with three wins from three as they overcame Leeds City Fourths 9-0. Craig White set up the opening two goals for Darren Inman before Rob Bordman crossed for White to put them 3-0 up. Bordman controlled a long punt upfield from goalkeeper Jonathan Storey to slot home. Martin Taffinder fired home after a scramble in the area, Rodger Teale added to the tally with a looping header, with substitute Tom Wigglesworth netting soon after. White scored his second with a shot across the goalkeeper and Rob Hiscox completed the scoring. West End Park slipped to an 8-2 defeat at home to Huddersfield Amateurs Reserves. Daz Smith gave Norristhorpe a 1-0 half-time lead in their Division Three game with Huddersfield Amateurs, who hit back after the break to earn a share of the spoils in a 1-1 draw. Norristhorpe Reserves suffered a 5-3 defeat at home to an impressive Middleton Park side in Division Four. Middleton made an excellent start and led thanks to a free-kick and added two more goals to put them 3-0 up at half-time. Two early second half goals extended the visitors lead to 5-0 before Norristhorpe changed things round and fought back. Right back Liam Wright hit a 35-yard cross-shot which flew in before George Woodcock scored with 25-yard free-kick. Kayne Whitehead’s powerful header made it 5-3 but Middleton held on for victory in a game which saw Mikey Payne named Norristhorpe’s MoM. Dewsbury Rangers earned a 2-1 win over Thornesians and lie sixth in Division One. Rob Smith put Rangers ahead with a 10th minute goal and Adam Smith added a second after the break to seal victory.